Join your squadron in a zombie hunt! Zombies have taken over Anheuser-Busch Brewery in Jacksonville, Florida. The local authorities are outnumbered and are requesting civilians to get a squadron together to clear the infestation. The future of Anheuser-Busch Brewery depends on the support of our community to rid the haunted brewery of the zombie infestation. Recruits will be guided by a commander that will get you up to speed quickly with Level 1 Basic Training and entrance into the admin building. Enter Level 2 as a Trainee and practice at the Zombie Basic Training Firing Range before reaching Level 3, inside the zombie infested brewery swarming with more than 80 zombies. Your zombie-hunting squadron (group of 10 people ages 18+ or 13+ with a parent) will put their skills to the test and defend the brewery. The Mission: Save the brewery by eliminating the infestation of zombies. The future of great beer is in your hands, so get your squadron together and prepare to storm the brewery and eliminate the infestation of zombies. Well, here’s a perfect opportunity to claim your new title. Bring your team to the Haunted Brewery and boost morale while also learning valuable lessons in group communication, organization and critical thinking. Buy tickets in advance and book a time to lead your squadron of zombie hunters through the zombie infested brewery! A self-pursuing zombie hunter yourself or a very special idea for your date. Corporate event outing to build team spirit in your company. You can go to our ticket page and purchase them online. You can purchase the day of the event at the festival entrance, but the pricing will increase the day of the event. Yes, kids age 12 and under receive free General Admission (Level 1). CAN I UPGRADE MY GENERAL ADMISSION TICKETS TO VIP TICKETS? Yes, we are allowing upgrades with tickets at the gate. If you bought a General Admission ticket and want a VIP ticket, you will be able to upgrade while tickets last at the festival gates. DO YOU HAVE TO PAY FOR BEER AND FOOD? All food vendors and beer is not included with tickets but take both cash and credit. VIP ticket packages may vary. Yes, there will be food to purchase at the event. There will be a combination of food trucks and catering companies. In the event of a rain delay, participants will be granted make up admission to another day of their choice to this event. Parking will be available in the parking lots for FREE around the brewery, as well as off-site lots through SUPER SHUTTLE buses on site that will rotate approximately every 10 minutes. Follow the signs for parking. Handicap Parking is located at the Brewery. WILL THERE BE ANY OTHER BEVERAGES BESIDES BEER AT THE EVENT? Coke products and water will be sold for 1 ticket ($2.50). No outside food or drinks are permitted. HOW OLD MUST YOU BE TO ENTER THE FESTIVAL? Bring the whole family. There are activities and games throughout the day that are fun for the whole gang. The HOPocalyptic Zombie Hunt is only attraction 18+. CAN YOU USE A CREDIT CARD TO PURCHASE TICKETS, BEER AND FOOD ONSITE? Yes. There will also be an ATM onsite for cash. We recommend bringing cash as the lines for credit card use might be longer than cash lines. WILL THERE BE ATMS TO GET CASH? Yes, we will have 4 ATMs onsite. WILL THERE BE ACCESS TO CABS OR ALTERNATIVE SAFE RIDES HOME? Yes, through ZTRIP. Get your promo code onsite for a $10 off safe ride home. DO WE HAVE TO BE THERE AT 5:30? No, the event is open from 5:30-11:30PM with haunts running all night. 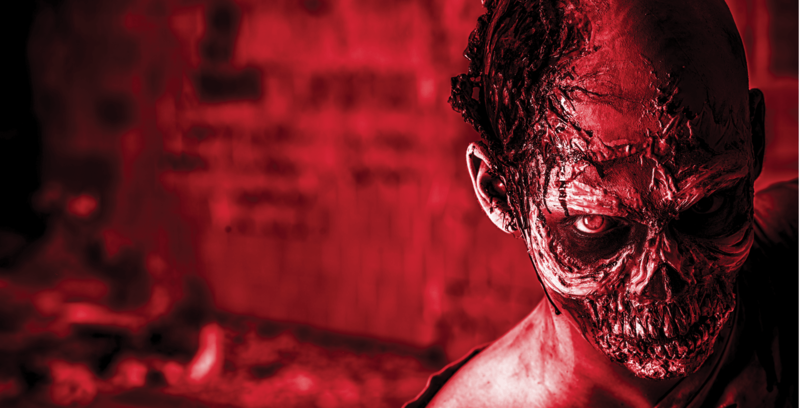 The last call to enter the haunt experience is at 11:00PM.